No matter what topic I may tackle, I often come back to the theme of connection, whether it’s on a personal or on a Universal level. It is fascinating to me that these connections can develop—or dissolve—in a moment. 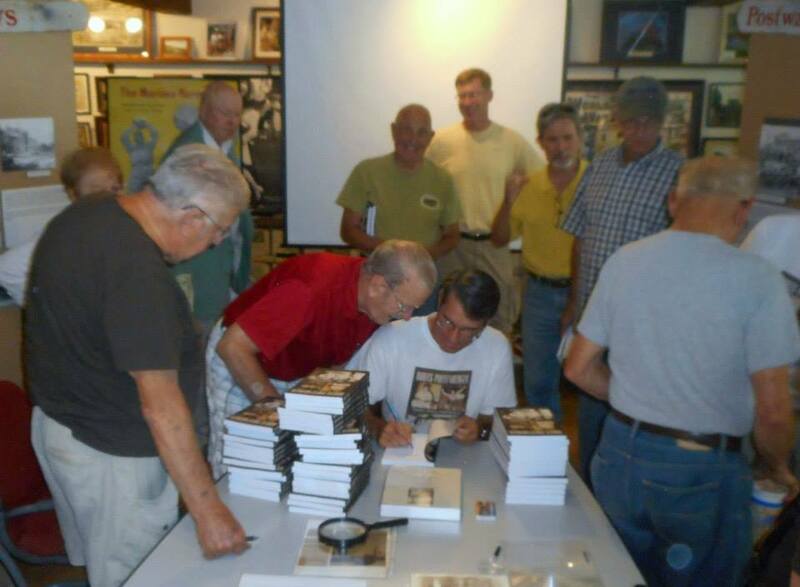 Signing copies of Boots Poffenberger’s biography at the Williamsport Town Museum, 2014.
single loved one back home. My interest in the war grew further when I reached that age when I could picture my parents when they were young. It is one thing to read history, and another to feel what those kids—my parents—must have felt as they were asked to put their lives on hold in order to save the world. The Secret of Their Midnight Tears series was born from those two thoughts. Time Is A Pool, a 10-story collection of flash fiction focuses on moments that can change a life, even if it’s in a humorous vein such as “How No Pants Johnson Gets His Nickname.” Other characters who appear include a charlatan minister who is presented with the opportunity to perform a miracle, and “Benny,” whom we know better as Death. My passion has always been baseball, perhaps because it is truly a game of inches, which is another way of saying, if the batter had swung 1/100th of a second earlier or later, then perhaps the game and the season and maybe an entire career might have turned out differently. I’ve written about a team, the New Market Rebels of the Valley Baseball League, and a person, Boots Poffenberger, who for a time was baseball’s most colorful character. I’ve written a few baseball short stories, and I’ve also written about why baseball is such a powerful passion for so many people. As the title perhaps implies, Fathers, Sons, & Holy Ghosts: Baseball as a Spiritual Experience, examines the connections to which baseball leads. Regardless of the subject, I truly enjoy “talking” to readers, although I suppose it’s more accurate in this day and age to say “messaging” with readers. After all, books are really a conversation, just one in which the author goes first and does a great deal of talking initially, but only initially. I hope that anyone who reads my books or simply comes across this author page will feel free to join the conversation. If you’re a baseball fan, please visit my Baseball Books page where you will find instructions on downloading Their Glorious Summer, the story of two collegiate summer league teams battling for the Valley Baseball League championship even as the Major League ballplayers were on strike in 1981. The download is free because I would like you to give my writing a try. Their Glorious Summer is regularly ranked in the Top 10 in Amazon’s Free Kindle Store “Baseball” category. If you are interested in fiction, please visit my Fiction page to find instructions for downloading “The Bedford Girl.” This is also a free download. Someone had to be the first ashore on D-Day and the famous “Bedford Boys” from Bedford, Virginia happened was that company. Very few survived. Typically, this got me to thinking about what would it have been like for a Bedford girl back home once she received the terrible news? I am a Nashville sports historian that has four books published. I have submitted a proposed book to Summer Games Books Publishers. If you don’t mind me asking, do you recommend them as a publisher? I appraciate any suggestions on them. I have your book of Boots Poffenberger a former Nashville Vol. I certainly can recommend SGB! I sent you a more detailed email, Bill, and I hope that helps. Let me know if you didn’t get it. You’re welcome! I’m so glad that the story found its way to someone who lived it. Austin, I don’t know if you remember me but we went to Western Maryland together (my maiden name is Weinberg). I just read about your writing in The Hill. I am an avid reader and my husband was a huge WWII history buff so I am looking forward to reading your novel. Certainly I remember you, Adele! So glad that you reconnected, and I hope you like book. You’ll have to let me know what you think. Just finished Midnight TEars. It’s a really good book Austin and you should be proud of your work. My late husband John and my son Patrick were/ are Marines so John in particular would’ve appreciated your choice of branch fior the boys in town to join. One minor inaccuracy that needs to be brought up- a young man does not become a Marine the day he signs up. He has to earn that title through successful completion of boot camp. I was reminded of that every day my son was in boot camp, the longest 13 weeks of my life! I could definitely relate to the mothers’ angst in your book, even though my son didn’t serve in wartime, he was still in danger every day. Can’t wait to read more of your books! Thank you so much for such a thoughtful reply, Adele. A happy new year to you and yours! I have a relative who will be playing in the Valley League this summer; where can I find a copy of Safe at Home? For a signed hard copy send a check for $20.00 ($15/book + $5 S&H) to me @ Austin Gisriel, 107 Fiesta Drive, Stephenson, VA 22656. Thanks for your interest and good luck to your relative!